The deadly collision of a pedestrian with a self-driving car last March in Arizona (USA) has reignited the controversy about the safety of “driverless” technology. This accident was not the first involving these vehicles, which suggests that a long road lies ahead in the improvement of these systems. However, the entrepreneur Elon Musk, who promotes these technologies through his company Tesla Motors, predicts that human driving will be outlawed in the future due to its greater danger. And the truth is that the private vehicle is not the only field in which driverless technology is making headway. We review here some of the initiatives underway in other modes of transport. Perhaps without being aware of it, we have already been travelling for years on a means of transport without a human driver. In April 1964, trains equipped with the Automatic Train Operation (ATO) system were tested on the Woodford-Hainault section of the Central Line of the London Underground. Four years later, the system began to cover the new Victoria Line, which became the first automated railway in the world. However, these convoys have an operator in charge of opening and closing the doors and putting the train in motion. Although the plans to remove the drivers from the London underground do not have the blessing of the current mayor, Sadiq Khan, the automation of trains has been spreading around the world. Numerous shuttle systems and metro lines already operate without a driver, but it is likely that autonomous systems will soon make the leap to the long-distance railway: the Vancouver Skytrain (Canada) and the Singapore MRT already cover about 80 kilometres. In the coming decade, the German operator Deutsche Bahn plans to introduce trains without drivers, and since 2017 the mining company Rio Tinto has operated a fully autonomous rail line in Australia of almost 100 kilometres. The dream of seeing the oceans traversed by autonomous ships has not escaped those companies with interests in the sector, and currently there are several projects aimed at introducing these ships in the very near future. The Norwegian companies Kongsberg (provider of navigation systems) and Yara (fertilizer manufacturer) are putting the final touches on what some have called the “Tesla of the seas.” The Yara Birkeland, a zero-emission autonomous container ship, will be able to navigate and dock itself in order to transport Yara fertilizer from the factory to the international port. Testing should begin this year with a small support crew, which will be replaced in 2019 by a remote control system operated from the land, before autonomous operations begin in 2020. The British firm Rolls-Royce also aims to let their robotic ships set sail in the same year, which is no coincidence: by 2020 it is expected that the International Maritime Organization will have adapted its regulations to the navigation of autonomous vessels. At first it is expected that these ships will cover short distances, but the great oceanic crossings are definitely on the horizon. 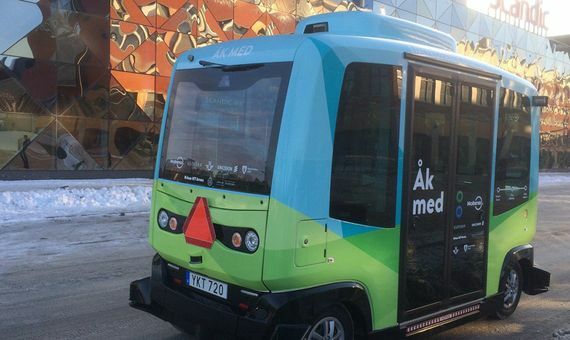 Last January, Stockholm put its first driverless buses on the road, electric vehicles with capacity for 12 passengers that travel 1.5 kilometres at a maximum speed of 24 km/h, pausing at bus stops and obeying traffic rules thanks to their systems of sensors. Although the vehicles do not have steering wheels, they do have a driver on board who can take the controls if necessary, as required by Swedish legislation. The result of a collaboration between Ericsson technology, local authorities and other partners, it is a pilot project with a duration of six months, but other cities in the world have been going down the same path ever since the first prototypes began to be tested years ago. For the time being, these vehicles generally operate in local environments, such as the technology district of the Chinese city of Shenzhen or the London Gatwick airport, but Singapore aims to introduce them in 2022 as a real solution to urban transport. On the other hand, companies like Mercedes-Benz have opted for semi-automatic vehicles that free the driver from part of the workload. Undoubtedly, one of the most futuristic proposals for urban transport that is already taking shape is that of the taxi-drones that Dubai intends to launch within a maximum period of five years. In September 2017, the first test was carried out in the emirate of the unmanned vehicle manufactured by the German company Volocopter, with capacity for two people and powered by 18 rotors. Once the service is up and running, a smartphone app will allow the user to request a vehicle, which will pick them up and transport them to their destination in a totally autonomous way, supervised by a central control station. The Dubai Roads and Transportation Authority is modifying its standards and regulations to allow the implementation of the service. Although this regulatory adaptation process will likely take more time in other places, some companies want to get ahead of the curve: the private transport network Uber is developing a project called Uber Elevate, with which it intends to take its philosophy of autonomous transport on demand to the air, with a service that would begin to be tested in the US and Dubai in 2020. The Uber Elevate vehicles will be manufactured by the American firm Aurora, recently acquired by Boeing. The Vahana project from Airbus, is also being developed with a view to making auto-piloted personal aircraft a reality. Nowadays, the idea of ​​flying on a plane without a pilot can be nothing short of chilling, and yet the autopilot is almost as old as commercial aviation. In 1947, a Douglas C-54 Skymaster of the US Air Force flew from Canada to England with seven crewmembers on board, but controlled entirely by the autopilot from take-off to landing. With today’s technologies, a future with autonomous aircraft is such a plausible goal that aeronautical firms are already envisaging it. Airbus and Boeing are involved in the development of Artificial Intelligence systems that will someday allow aircraft to fly by themselves or with a single pilot, one solution to the shortage of trained professionals that both companies foresee for the coming decades. But in addition to the technological challenge and the legal obstacles—all current commercial aircraft are certified to fly with two pilots—another obstacle will be the perception of the passengers. Last August, a study by the Swiss financial company UBS revealed that only 17% of the respondents would travel on a plane without pilots.